Visit the showcase site for Music Then and Now. A “you are there” guide to masterpieces of Western music. Music Then and Now engages students with rich, contextual history by putting them in the moment when the music was first written, performed, and heard. Kelly treats music as contemporary to its own time. Each chapter focuses on a single masterpiece or small cluster of related works—when they were new. Each chapter is organized into three parts—the setting, the music, and the performance—and framed by a contextual introduction that sets the stage and a “Then and Now” conclusion linking the past to the present. In addition, the chapters feature Composer Biographies along with “In Their Own Words” and “You Are There” sidebars to bring the music alive. Six Part Introductions, which provide concise overviews of the major political, artistic, and intellectual trends of the day, frame each historical period. 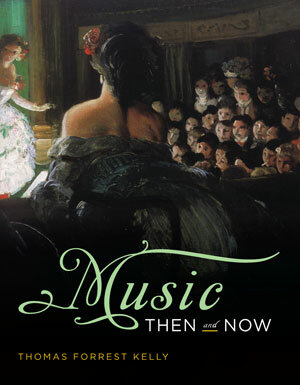 Music Then and Now teaches critical listening skills by focusing on 28 works in great depth. Eighty-four Listening Guides (including multiple guides for longer works) highlight essential musical features in real time, teaching students how to listen. “What to Listen For” boxes spotlight big ideas, and Interactive Listening Guides and Listening Quizzes teach students to thoughtfully engage with all musical styles and genres. The text begins with a brief unit on Fundamental Musical Concepts, teaching students how to listen and what to listen for, accompanied by Author Videos that walk students through the elements of music. Each element is also illustrated with a brief excerpt from the core repertoire. Dynamic author videos, 32 in all, demonstrate how to listen and what to listen for. Six videos walk students through the elements of music, illustrating each element with pithy music examples. The balance of the Author Videos highlights the defining features of individual works. Other videos include the Instruments of the Orchestra, which shows each instrument family in action. and the Metropolitan Opera Videos, which place students in front-row seats to enjoy stunning performances of Don Giovanni, La Bohème, Rigoletto, La Traviata, Die Walküre, Wozzeck, and Doctor Atomic.